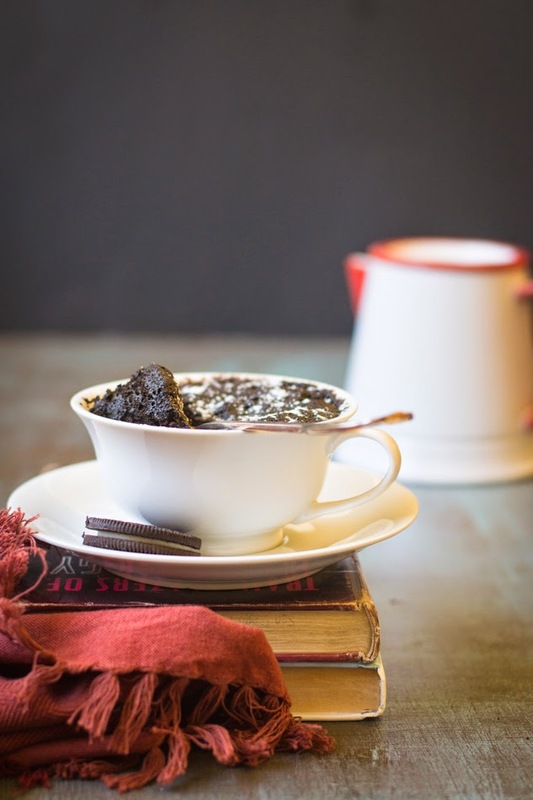 After a week’s break, I am back with a new recipe of a Mug Cake. World cup ended with a sad note for our family. Because my husband is an old Argentina supporter and I liked Messi because of his innocence look. We got an opportunity to watch the match in a big screen organized in their office and first time I saw my husband so excited. Though my son started with supporting Messi, he changed his mind once Germany won. Because he has to always win! Anyway, besides that life was good in the peak of summer vacation. We had a road trip to Big Sur on Labor Day weekend, enjoyed some breathtaking views, long-drive on US-1 and eating out in different places on the way. 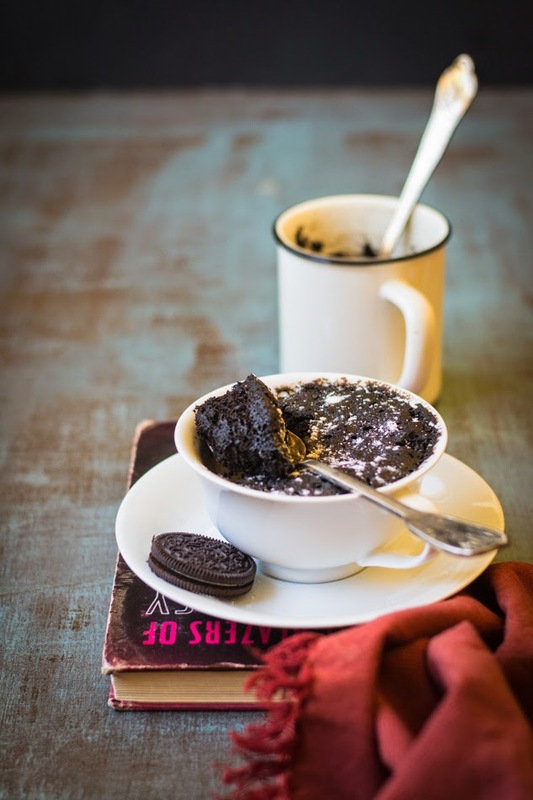 I am going to share the recipe of Oreo Mug Cake. It’s perfect if you have busy schedule and have no time to try any complex recipe. 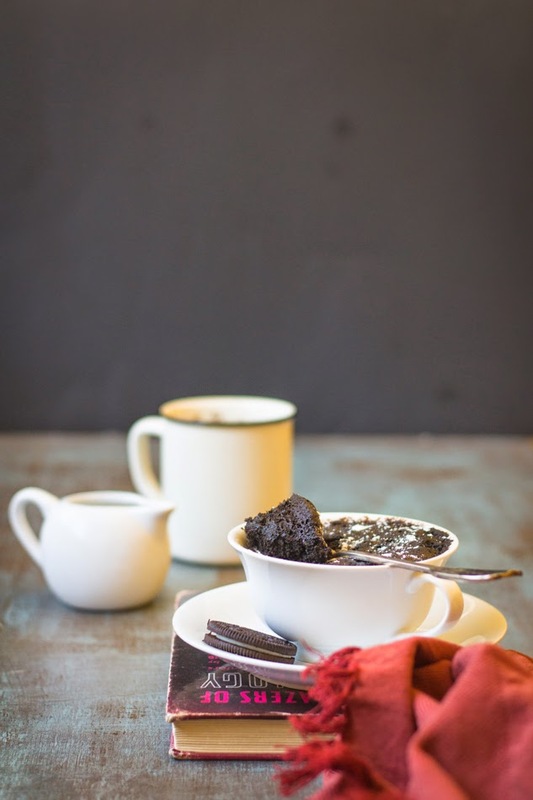 I love the concept of microwave mug cake. Stir a few ingredients in a mug and put it in the microwave for a minute or two and it’s ready to serve. When I tried the mug cake first time, I realized that microwaves can be used for other purposes than heating frozen meals or making popcorn. 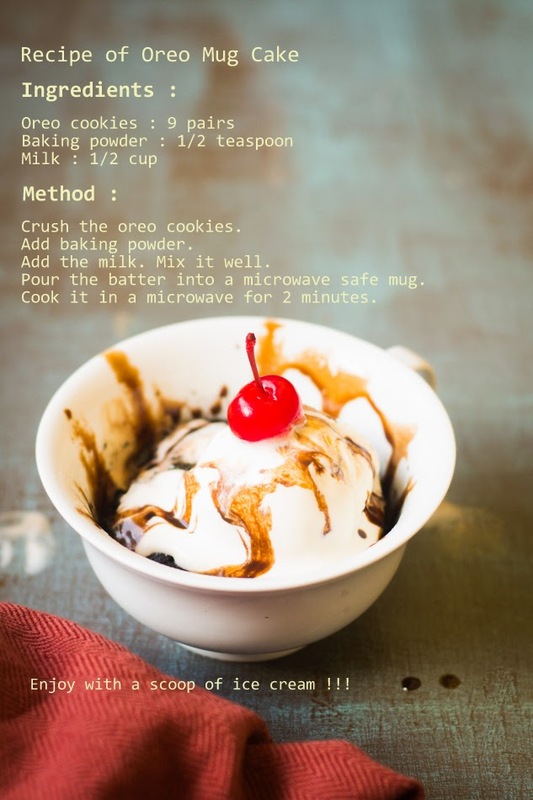 It’s not so new concept but I came across this easy recipe of making Mug Cake in microwave very recently. My temptation got stronger when I saw that it needs only three ingredients to make. It's full of chocolate flavor and has a great texture. The end product came out really tasty, but not so spongy and not overly sweet. This recipe is flexible enough to be built with other flavor combos. You can make fun additions like chocolate chips, marshmallows or nuts or Nutella spread to the recipe. Or serve it with a topping of peanut butter or chocolate sauce or with a scoop of ice cream. I promise this would be your new favorite mid-night chocolate snack. 1. Crush the Oreo cookies(do not remove the cream of the cookies) roughly. You can use food processor or blender. Or take a Ziploc bag, put the cookies into it. Take a rolling pin and gently press it. 2. Take a bowl transfer the crushed cookies to it. Add the baking powder and combine well. Add milk and mix the batter until incorporated. 4. 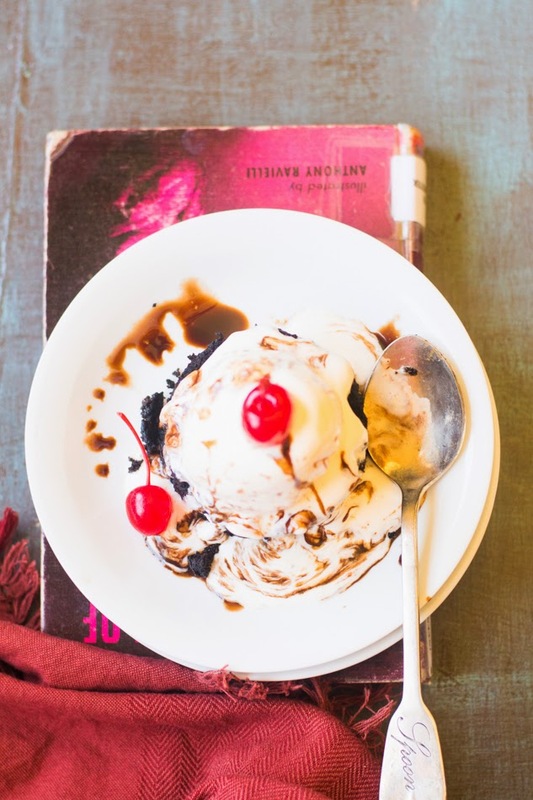 Let it cool down for 10 minutes and serve with a scoop of ice cream and chocolate sauce. Beautiful photographs Rumela. Well done! achha, 9 pairs? maane 18 cookies? or you mean 9 cookies which contain 18 biscuits with cream sandwiched between them . Yes 9 cookies, that means 18 biscuits. That quantity will fit for a mug cup. Gr8 recipe..took 5 mins max to prepare.. super easy. . Hope it tastes gud when it cools.. Thanks a ton..
Have you ever made it with almond, coconut, or rice milk? Can these be used as alternatives or would that completely alter the end product? Sad !! But have no idea, how to stop these kind of people. 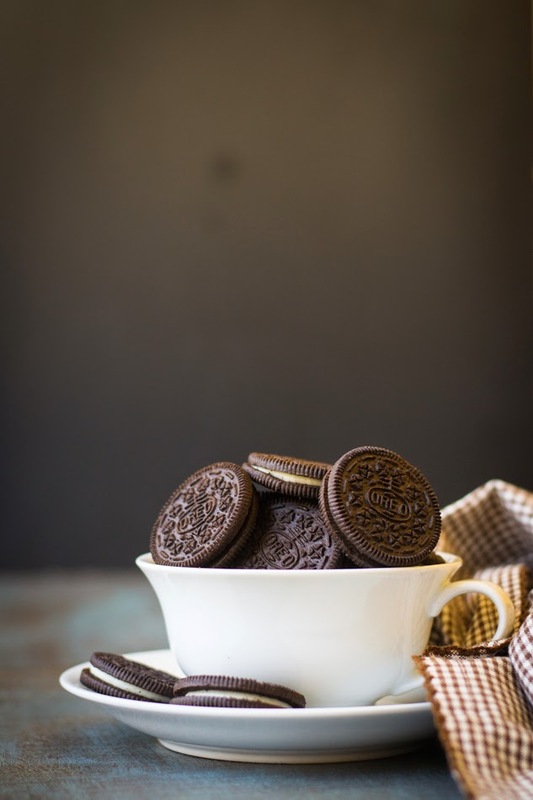 Can we use any other cookies instead of oreo.